Zagat’s restaurant guide, which has been a staple for discerning food lovers since it first began publishing reviews and survey results more than thirty years ago, recently named Black Barn as one of the top 10 outdoor dining spaces in New York City for Summer 2016. We aren’t surprised, considering its beautiful sidewalk location looking out on the northeast corner of Madison Square Park and the restaurant’s glorious food. Open for breakfast, lunch and dinner, the new outside space provides a relaxing way to spend time enjoying NoMad’s street life, the lush foliage and flowers of Madison Square Park and the beautiful sun and moonlight through the Park’s trees. Eating there is like having a picnic in the Park. Zagat also noted that Black Barn, which has already established itself with the lunch, brunch and dinner crowds, in now offering breakfast, with menu items like the Black Barn’s spicy pork sausage and their corn cakes and chorizo with black beans, eggs and cheese and cilantro cream — yum! And remember, Black Barn serves brunch on the weekends, making it one of the few places you can brunch outside with a soothing country-like view. It’s always heartening to see a major publication give a business in our District the recognition it deserves. 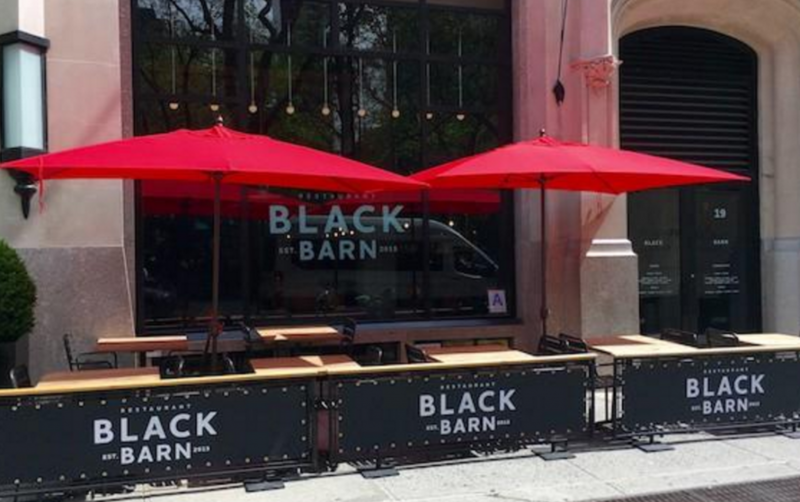 Hearty congratulations to Black Barn and Chef John Doherty.